It is impossible to come up with a list of ten climbing roses that will please everyone. The reasons for planting climbing roses will inevitably vary from gardener to gardener. Luckily for gardeners, there are a plethora of natural climbers, ramblers - and shrubs that can also double as climbers - from which to choose. Less luckily for list makers, for nearly every rose included in a list there are at least two gorgeous alternatives. The following list was compiled after poring over many gardening publications, and picking out those roses that were singled out for praise numerous times, but wouldn’t fall into the, “Oh, everyone plants one of those,” category. Bred by David Austin, Graham Thomas is a vigorous, medium-sized shrub rose that can also be grown as a short climber up to 2.4m. It features glossy bright green foliage and rich yellow flowers that are fragrant, cupped, fully double, as wide as 11cm, and that bloom freely from summer to autumn. Hardy to RHS zone H6, Graham Thomas prefers full sun with fertile, humus-rich, and moist soil that is well drained. Also bred by David Austin, A Shropshire Lad is a healthy, vigorous, reliable, and almost thornless shrub rose with an arching habit that can also be grown as a short climber up to 2.5m. Its peachy pink flowers are double, large, cupped, and will bloom from summer through autumn. Hardy to RHS zone H6, A Shropshire Lad prefers the same soil and growing conditions as Graham Thomas. Another David Austin rose, Abraham Darby is a hardy, disease resistant climber that will grow up to 3m. Its large, (2-3m) flowers are refreshingly fragrant, and bloom repeatedly all season in shades of apricot, yellow, pink, and cream. Hardy to RHS zone H6, Abraham Darby prefers the same soil and growing conditions as Graham Thomas. An old climbing tea rose that will vigorously grow to 4m, Sombreuil features dark green, glossy foliage, and very large, fragrant, pure white flowers with a touch of pink at the centre, that bloom repeatedly all summer. Hardy to RHS zone H4, Sombreuil prefers the same soil and growing conditions as the other roses on the list. 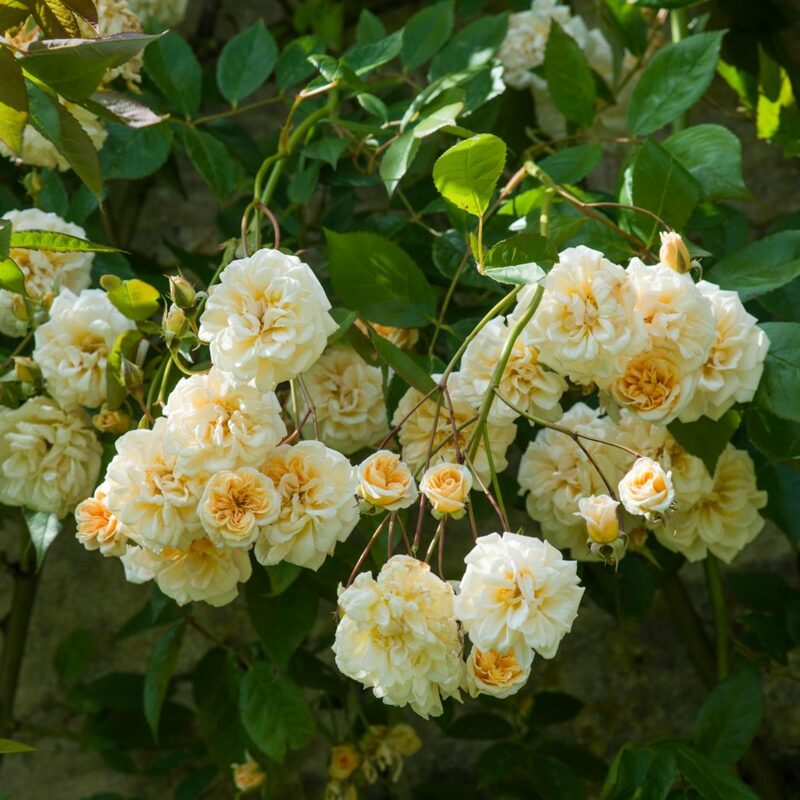 Another old, climbing, repeat-blooming rose is Alister Stella Gray, which features buds the color of egg yolks that open to a buttery-yellow with double rosettes, appearing first in small groups followed by large repeat sprays. Alister Stella Gray will grow up to 5m. A classic red rose that blooms all season, Dublin Bay features clusters of deep burgundy-red, lightly scented cupped flowers on good long stems, which are excellent for cutting. This rose can grow up to 3m tall. Yet another David Austin rose, Teasing Georgia is another shrub rose that can be grown as a climber up to 2.5m. Its cupped, two-toned deep yellow and lemon flowers bloom throughout summer and autumn. Hardy to RHS zone H6. A vigorous, large, nearly thornless climbing rose, Cécile Brünner will reach anywhere from 2.5 to 4m in height. It features copious smooth dark green leaves, and 4cm wide, fully double, pale pink flowers. Hardy to RHS zone H5. 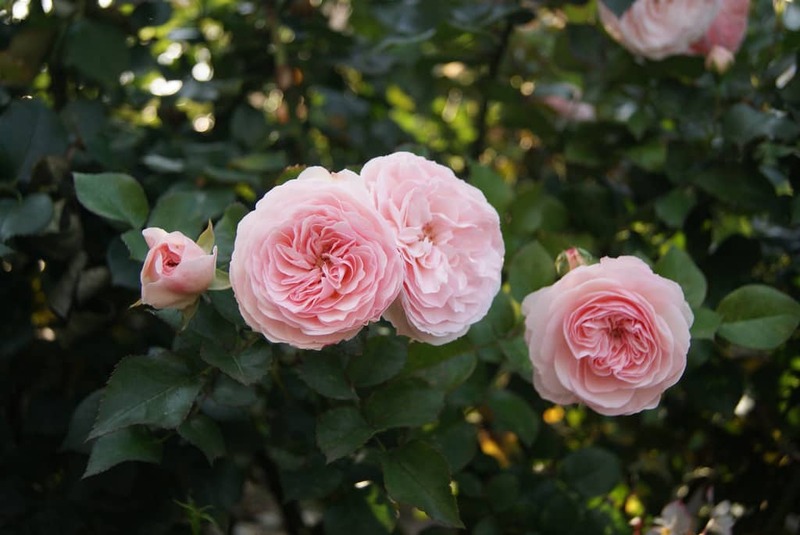 Yet another David Austin rose, Gertrude Jekyll is a shrub that climbs up to 2.m It features broad, healthy grey-green foliage with a classic old rose fragrance emanating from, fully double, glowing bright pink flowers that bloom continuously through summer and autumn. Hardy to RHS zone H6. An attention-grabbing miniature climber, Warm Welcome blooms virtually continuously in masses of semi-double, bright orange flowers from the top nearly to the bottom of the plant, which reaches an eventual height of 2.5m.